We often get questions from clients about noise laws in California, and whether noise levels from certain aftermarket pipes will result in a ticket. While we can quote the motorcycle noise level law in California (80 decibels for bikes built after 1985) that doesn’t really answer the fundamental question on riders’ minds, which is: “Am I going to get pulled over and hassled by a cop for my after-market pipes?” There is obviously no hard and fast rule on this issue, but in general, you can reduce the risk of getting hassled by NOT revving your engine at intersections. Seems pretty obvious that sitting at an intersection revving your engine so loud that it sets off car alarms and makes people cover their ears might get you in trouble! The following is a California Highway Patrol bulletin that has been circulating around the internet for some time. Remember, these kinds of documents reflect CHP policy only (which can change), and in any event, are not law. Further, other law enforcement agencies may have very different policies. As such, we stress that this is offered for informational purposes only. The California Highway Patrol, Commercial vehicle Section, has received many inquiries about excessive noise emitted by passenger vehicles, light trucks and motorcycles. Enforcement personnel and the public have inquired regarding enforcement of the Vehicle Code sections pertaining to excessive noise emitted by these vehicles. Excessive Noise is primarily a nuisance issue rather than a safety concern, and determination of excessive noise is subjective. For this reason, enforcement personnel are to exercise sound professional judgment in making a determination of violation. The following guidelines and attached question and answer sheet ( attachment A) provide guidance to enforcement personnel regarding appropriate enforcement procedures. When clearing excessive noise citations issued by the CHP or allied agencies, personnel are to consider exhaust systems in compliance if they incorporate a reasonably effective muffler, do not emit an offensive, harsh, excessive noise, and appear to be in good repair. Q1. Doesn’t the VC require a muffler on every vehicle? Yes. Section 27150 VC requires that every motor vehicle subject to registration be equipped with an adequate muffler. There are no exceptions -all vehicles must be equipped with a muffler, as defined in Section 425 VC. A turbocharger is not considered a muffler. Q2. Aren’t all exhaust system modifications prohibited? No. Section 27151 VC prohibits the modification of the exhaust system to amplify or increase the noise emitted by the vehicle, making the vehicle not in compliance with Section 27150 VC or exceeding the noise limits established in Sections 27201-27206 VC. Section 27151 VC does not prohibit all modifications to an exhaust system. It also does not prohibit all modifications that increase the noise level of the exhaust system over that of the original, factory installed exhaust system (as it did until 1980) It only prohibits modifications that result in a noise level higher than those specified in Sections 27201-27206 VC. Accurately determining compliance with Sections 27201-27206 VC for enforcement purposes is generally impractical. Enforcement personnel must make an informed professional evaluation to determine if excessive noise statutes are being violated. Q3. Do I have to actually listen to a vehicle to cite it for a violation of either Section 27150 or 27151? Yes. Drivers of vehicles should not be cited for violation of either Section 27150 or 27151 VC unless the officer has personally listened to the vehicle in operation. This can be either under actual driving conditions or with the vehicle stationary and the engine running. Even if the officer has inspected the exhaust system and does not see a muffler present, the officer should listen to the vehicle. The purpose of this is to be sure that the exhaust system does not incorporate internally baffled pipes or other components that meet the definition of a muffler. There are so specifications which state required configurations or minimum dimensions for mufflers. A vehicle that does not visually appear to be equipped with a muffler, but does not emit excessive noise, should be deemed to comply with sections 27150 and 27151VC. Q4. Does an aftermarket replacement or modified tailpipe or muffler tip constitute a violation of section 27151 VC? No. Section 27150 VC prohibits the modification of exhaust systems to amplify or increase noise. The officer would have to establish that the modification increased the noise emitted by the vehicle by listening to the exhaust. In general, exhaust system piping, tubing, fittings, cosmetic tips or other passive devices placed behind the muffler have minimal impact on exhaust system sound levels. Q5. Since Section 27150 requires that the muffler prevent excessive and unusual noise, can the driver of a vehicle be cited for violation of Section 27150 if it emits a sound different than the original factory installed muffler? No. The prohibit against unusual noise refers to noises that are unusual for motor vehicles. Noises that may be unusual for a particular for other motor vehicles, should not be considered in violation, provided the noise excessive. Q6. Aren’t all modified exhaust systems unlawful under pollution control laws? No. 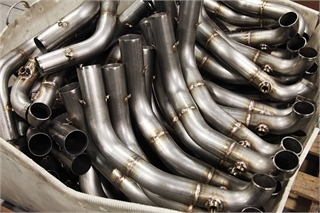 Current pollution control laws regarding aftermarket exhaust systems are quite complex, but do permit the installation of variety of aftermarket and “exempt” systems. Due to the complexity of modern pollution control systems and the laws governing them, the CHP does not provide technical training in this area. Enforcement of pollution control laws is the responsibility of the Bureau of Automotive Repair through the “Smog Check” program. Q7. What are the noise levels specified in Section 27201-27206 VC? Can these be used to cite loud vehicles? No. Section 27200 VC prohibits the sale of new motor vehicles that exceed the noise limits specified in these Sections. The specified noise limits (80dB-A) for all new cars, pickup trucks, vans and motorcycles apply only to new motor vehicles, under full throttle acceleration tests, measured 50 feet from the test vehicle, as specified in Section 1040-1044, 1046 and 1047, title 13, California Code of Regulations (13 CCR) These noise levels and the specified test methods apply to manufacturers and new car dealers only, for new vehicle certification purposes, and may not be used for enforcement purposes against vehicles being operated on public roadways. The CHP is not aware of any significant violation of Section 27200 VC by vehicle manufacturers or dealers. Q8. What are the noise levels specified in Section 23130 and 23130.5 VC and how can they be enforced? Section 23130 and 23130.5 VC specify noise standards for vehicles operating on the highway, and are intended for use in actual traffic conditions. The limits of Section 23130 apply under all conditions of grade, load acceleration and deceleration. The lower limits of Section 23130.5 apply only to relatively level roadways and under conditions of relatively constant speed. They specifically do not apply to areas of congested traffic that require noticeable acceleration or deceleration, or within 200 feet of an official traffic control device or change in grade. Although these sections were intended for use in actual traffic conditions, the complexities of noise testing require the be conducted in a relatively large open area free of other vehicle and large sound-reflecting objects. This makes in-use vehicle noise testing in most developed areas impractical, where noise complains are most likely to occur. The CHP currently does not provide either the instrument or training necessary to conduct vehicle noise testing. Enforcement using Section 27150 or 27151 VC is usually more appropriate and effective. Q9. What is the exhaust noise test specified in 13 CCR? Can this be used for enforcement? Section 1030-1036, 13 CCR, were intended to be used by Licensed Muffler Certification Stations as a means of detection if an exhaust system met the requirements of the Muffler Certification Program (When those programs were operational) They specify testing procedures for motor vehicle exhaust noise alone (as opposed to total vehicle noise) This procedure specifies a limit of 95 dB measured 20 inches from the exhaust pipe outlet with the engine operating in neutral, typically at speed of 3000-5000 rpm. It applies only to passenger vehicles. It does not apply to motorcycles or to vehicles over 6000 pounds gross weight. Q10. Can this test be used in enforcement? Not Readily. Although much simpler than the test methods specified in Section 23130 and 2310.5 VC, this test method still requires some technical expertise and a means to determine both the speed of the engine under test and the RPM at which maximum horsepower of the engine is developed, as well as sound level meter. The CHP does not currently provide either the instrument or training necessary to conduct exhaust noise testing. This test is useful, however, for determining if an aftermarket or performance exhaust system complies with VC requirements. It should be noted that the 95dB level, because it is intended as a simple “go-no-go” type of test, may permit exhaust noise somewhat higher dm those permitted under Sections 27201-27206 VC. An exhaust system that complies with the requirements of Sections of Section 1036d-1, 13 CCR, is deemed to comply with Sections 27150 and 27151 VC. Q11. What happened to the Muffler Certification and the Licensed Muffler Certification Station Programs? Funding for both programs were determined in 1979. There are currently no Official Muffler Certification Stations, no listing of certified mufflers and no formal mechanism in place to conduct objective vehicle or exhaust noise testing. Q12. Can local authorities enact or enforce more strict ordinances regarding vehicle noise? No. Section 21 VC makes the VC applicable and uniform throughout the state, and prohibits local authorities from enacting or enforcing any ordinance on the matters covered by the VC unless expressly authorized to do so. In-use vehicle noise is addressed in Sections 23130 and 23130.5 VC. There is no provision in the VC that permits local authorities to adopt additional noise limitations. Consequently, citations issued such ordinances are invalid. Q13. Some aftermarket exhaust systems include documentation that the system has tested and found to meet the requirements of section 1036d-1, 13 CCR. Are those legal? The CHP does not have the resources to independently verify manufacturer’s claims, but is aware that some aftermarket exhaust systems do meet the noise levels specified in Section 1036 d-1, 13 CCR. An officer may consider such documentation in evaluating an exhaust system for excessive noise, both during the issuance of a citation and when clearing a citation pursuant to Section 40610b VC. Q14. What type of enforcement action should be taken against vehicles emitting excessive noise? Providing none of the disqualifying conditions listed in Section 40610b are present, the use of the CHP 281, “Notice to Correct” or checking the Dismissible Violation “Yes” box on the CHP 215, “Notice to Appear to Appear-Arrest Citation”, would be appropriate for these violations.